Whiting understands that designing overhead cranes for hydroelectric power generating plants require expert planning and regulatory compliance throughout the engineering and manufacturing process. Whiting overhead and gantry cranes help to maintain the uninterrupted service from Hydro-Electric Plants that sends billions of kilowatts to American industry; keeps industrial plants humming; and homes and streets lighted and safe. The use of these cranes has a direct effect on the downtime associated with repair or with the time involved in a planned outage, when the inability to generate electricity in one day could exceed by several times the initial cost of the crane. Whiting offers complete single sources responsibility for all crane components from design through manufacturing, installation, and lifetime support including field service, modernizations, and replacement parts for years after the initial purchase. 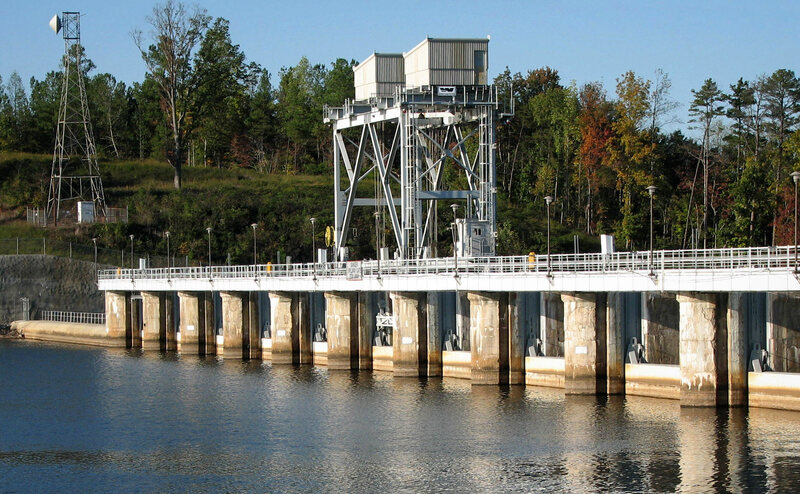 Gate handling cranes are mainly used to raise and lower dam gates to control the flow of water from the reservoir or to raise and lower bulkheads and trash racks. Turbine cranes require accurate positioning for spotting loads during installation, maintenance or removal of the turbine and related equipment. They also have a high load rating (usually 100 to 500 tons), long span (over 1,000 feet) and high lift (over 80 feet).